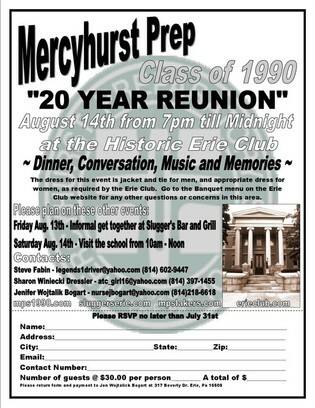 Welcome to the Mercyhurst Preparatory High Class Of 1990 web site. This site will be used for the planning of the 20 year reunion. It is with great sadness that we inform you that our classmate Pamela Ann (Mannarelli) Shovlin passed away November 12th, 2011. As you are well aware, Pam was a free spirit whose life, though tragically cut short, is to be celebrated for the many people she has touched over the years. Our thoughts and prayers are with both Pam and her family. "In lieu of flowers, please send memorial contributions in Pam's memory to the Pamela Shovlin Family College Fund, c/o McQuillan Group, 127 Anderson St., Suite 201, Pittsburgh, PA 15212." Let's help out her family in this tough time. Check out a collection or reunion photos by clicking here. You can view and print a full size form here. August 14: The reunion itself will be held Saturday at the Erie Club (www.erieclub.com) from 7pm on. The cost will be $30 per person. A formal email with an RSVP will be coming soon! Thanks to Steve Fabin, Sharon Winiecki, Jen Wojtalik, and any others that have helped to set this up for us. The reunion will be held Saturday Aug. 14th at the Erie Club on the corner of 6th and Peach. More details will follow later, but you can click here for more information about the Erie Club. All class members have now been added along with yearbook photos. Please encourage people to enter their email addresses and other info so that future announcements will get to the right people.